Clash Royale Bot 1.4.3 - Released! | Clash Royale Bot Forums Clash Royale Bot 1.4.3 - Released! Clash Royale Bot 1.4.3 - Released! which emulator do you recommend for clash royale bot? 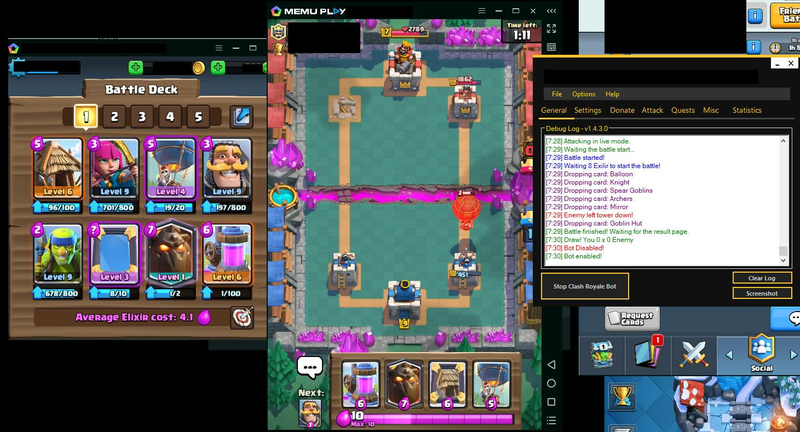 (04-02-2018, 01:06 PM)lorenzopoggi32 Wrote: which emulator do you recommend for clash royale bot? ok i use memu 3.6.7.0 and the game language in clash royale is english but the problem is not solved when I click Detect Deck there is an error message: Could not move to the Cards page to get your deck data, trying again in a few seconds; after clash Royale ask me if I want to close the game. Like the previous version, in Nox avec selected NoxPlayer in emulators list I get an error : could not find Now install folder, if you keep seen this message, report in forum. Previously, I have change the nox VM folder from Nox Gui (because in the default location clash royal nevers start). It's now in "My Documents". I think the bot check on default folder "program files". compruebe los pls ... alguna vez ... ¿por qué? (04-05-2018, 09:53 PM)My_siki Wrote: Previously, I have change the nox VM folder from Nox Gui (because in the default location clash royal nevers start). It's now in "My Documents". I think the bot check on default folder "program files". Yes, you must keep it in the Program Files, or it won't find the emulator, the emulator installation folder probably has nothing related to the APP not running inside the emulator. "Your emulator resolution is wrong, we gonna try to fix it for you and restart the emulator"
Current time: 04-23-2019, 08:40 AM Powered By MyBB, © 2002-2019 MyBB Group.